The top of the existing isolation valve can easily be replaced by the VAS valve adapter fitting (as per DIN 3512). This makes it possible to quickly install the GRANDER® Apartment Units into existing supply pipes without cutting or prying open the pipe of the apartment or flat. These GRANDER® Apartment Units are also available for screwable ISTA water meters. Installation Accessories for Apartment Units: extension assembly kit for 1/2", 3", 4"
The revitalizing effect of the GRANDER® Inline Units remains consistent year after year. For more than 20 years satisfied users have confirmed the continuous operation of their units without the need to update, recharge or replace them. 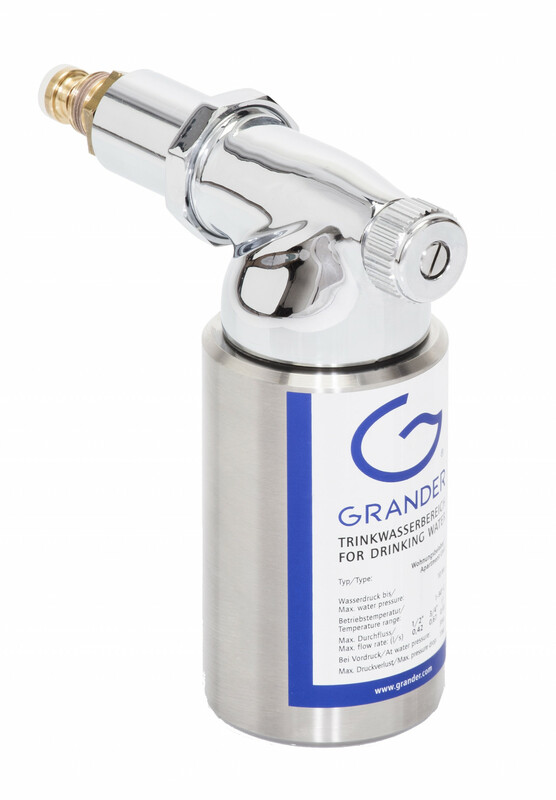 GRANDER® water remains effective even with irregular usage, extended idle periods, extensive pipe systems and circulation, etc. The hygienic and technical harmlessness for the use of the original GRANDER® Inline Units in drinking water is confirmed through the expert report (University Graz, TUEV Vienna). GRANDER® Inline Units work on the basis of purely natural energy, that means: no electricity, no chemical additives and no service or maintenance required. GRANDER® Apartment Units are manufactured in durable high quality V2A stainless steel ensuring a long life span.